Depending on the setup of your home office, you may find it particularly challenging to find just the right rug for the space. From having a smaller budget for the room than you have for public areas (I’m not the only one prioritizing the family room over the office, right?) to needing a rug that’s larger–or smaller–than average, to needing something that strikes the perfect balance between professional and your personality… That’s a tall order! I need a 8 x 10 rug, but have you seen the prices on those suckers?! So, any advice for a simple (preferably solid color, or modern design) rug in that size that’s under a grand? 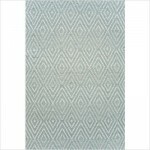 The woven diamond rug from Dash and Albert has a low key, sophisticated pattern. It comes in several colorways, so if the light blue/ivory’s not quite right (or doesn’t have enough contrast for your space), make sure to check out the others. Be aware that it’s an indoor-outdoor rug. 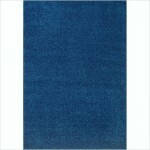 This luscious cobalt blue rug, the Modern Times Harmony Blue Jay Rug, is definitely not subtle. It’s also a great price at just $300 for the 7’9″ x 10’9″ size. Though the pattern on this rug is a bit more dramatic than the other options I sent Laurie, it still strikes a nice balance between being interesting and yet not feeling old-fashioned. Be aware that it is made of Polypropylene, which accounts for it’s really low price (just $175). Other challenges for choosing rugs for a home office include needing to deal with the office chair legs (make sure to pick up a rug protecting mat), but in Laurie’s case that wasn’t an issue due to her office set up. If it is an issue for you, you’ll probably want to only choose from rugs you see in person–it can be tricky to determine how tightly woven/dense/and tall a rug is from its online description and photos. 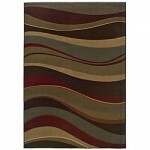 What do you look for in choosing rugs for your home office? Or have you left the floors rug-less?